Charming Danish actress Karina Bell (1898-1979) was the most popular female star of the Nordisk Film Kompagni in the 1920s. The blond and slim actress was the beauty ideal of her generation. 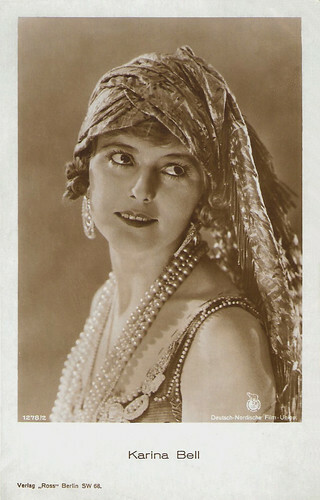 She also appeared in silent German and Swedish films. In later life she became the CEO of a Danish brewery. German postcard by Ross Verlag, no. 1624/1, 1927-1928. Photo: Nordisk Film. Publicity still for Klovnen/The Clown (A.W. Sandberg, 1926). Yugoslavian postcard by Edit. Cakovic, Zagreb, no. 3747/1. Photo: Mosinger Film. Publicity still for Klovnen/The Clown (A.W. Sandberg, 1926). German postcard by Ross Verlag, no. 1278/2, 1927-1928. Photo: Nordisk Film / Deutsch-Nordische Film-Union. 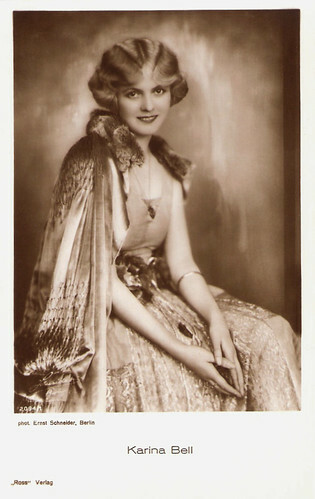 Publicity still for Maharadjahens yndlingshustru III/The Maharaja's Favourite Wife III (A.W. Sandberg, 1926). German postcard by Ross Verlag, no. 3747/1, 1928-1929. Photo: Terrra Film. Publicity still for Revolutionshochzeit/The Last Night (A.W. Sandberg, 1928). German postcard by Ross Verlag, no. 2094/1, 1927-1928. Photo: Ernst Schneider, Berlin. Collection: Didier Hanson. Karina Bell was born Karina Parkov in Hellerup, Denmark, in 1898. She was the daughter of Hans Peter Hansen and Anette Marie Nielsen. 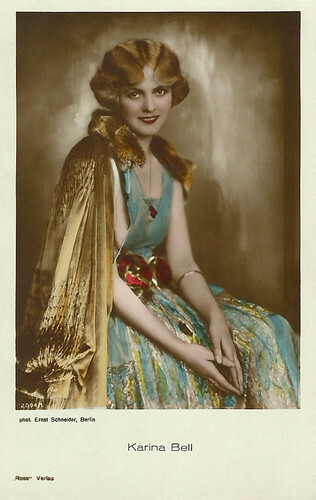 She followed lessons at the ballet school of Emilie Walbom and at age 21, she made her stage debut with the leading role in Tornerose (Sleeping Beauty) (1919) at Det nye Teater (The New Theater). Soon her first film appearance followed in Blade af Satans Bog/Leaves from Satan's Book (1919, released in 1921) by the now legendary director Carl Theodor Dreyer. Next she appeared in the Swedish production En ung mans väg/A young man's road (Carl Barcklind, 1919) opposite Philip Bech. Bell also played in Benjamin Christensen’s presumed lost film Helgeninderne/Helge Indians (1921) and in his famous fictionalized documentary Häxan/Häxan: Witchcraft Through the Ages (1922), showing the evolution of witchcraft, from its pagan roots to its confusion with hysteria in modern Europe. Her breakthrough was the Charles Dickens adaptation David Copperfield (A.W. Sandberg, 1922). Anders Wilhelm Sandberg was between 1916 and 1926 the leading director at the Nordisk studio. Karina Bell would star in a string of 15 films by Sandberg. Together they would also make for Nordisk Paa Slaget 12/Twelve O'Clock (1923), Den Sidste dans/The Last Dance (1923), the comedy Kaerlighedsoen/Love Island (1924) with Gunnar Tolnaes, and Wienerbarnet (1924). She also played the title role in another Dickens adaptation Lille Dorrit/Little Dorrit (A.W. Sandberg, 1924), with Frederik Jensen. Other films by Sandberg were Kan kvinder fejle?/Can women fail? (1924), Morænen/Moraine (1924), Min Ven Privatdetektiven/My Friend, the Private Detective (1924), Fra Piazza del Popolo/Mists of the Past (1925), and Maharajahens Yndlingshustru/The Maharadjah's Favourite Wife (1926). Their last film for Nordisk was a remake of Sandberg's first success Klovnen/The Clown (1926), in which Karina Bell costarred with Gösta Ekman. Due to their lack of financial support to the production of Klovnen, Sandberg broke with Nordisk and he finished the film with his own funds. The film would become Karina Bell's international breakthrough. Danish postcard by Eneret, no. 629. Photo: publicity still for Kan Kvinder fejle/Can women fail? (A.W. Sandberg, 1924). This romantic comedy was partly shot in Liguria, Italy. Director A.W. Sandberg told the newspapers the film crew started filming in Trieste and at Lake Garda, but as in two days two and a half meters of snow fell, forcing the crew to withdraw to Verona and Venice. As winter still chased the crew, they moved on to Bordighera on the Italian Riviera. Here they got finally the weather they wanted, and the images were recorded under a scorching sun in 30-35 degree heat, according to Sandberg. After their return from Italym the crew shot interior shots in Valby, where among other things a set was built that envisioned 'a wealthy home'. To make the interior as compelling as possible, Sandberg almost emptied his apartment at Nørregade to provide props, such as chairs with embroidery made by his wife Elsa Fröhlich, paintings of snowy landscapes made by his father-in-law Thaulow, and an old dresser with bronze female statues by sculptor Jean René Gauguin, son of painter Paul Gauguin. 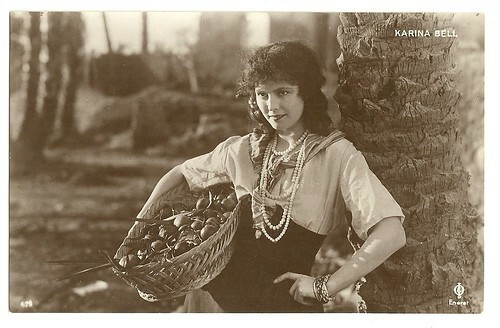 Finnish postcard by Kortcentralem, Korttikeskus, 1925. Karina Bell is written as Kaarina Bell. Danish postcard by Alex. Vincent's Kunstforlag, Eneret, no. 254. Photo: publicity still for Revolutionsbryllup/The Last Night (A.W. Sandberg, 1927). This was a German-Danish dramatization of Sophus Michaëlis' play Revolutionshochzeit (Revolutionary Wedding), with Gösta Ekman, Karina Bell, and Diomira Jacobini. 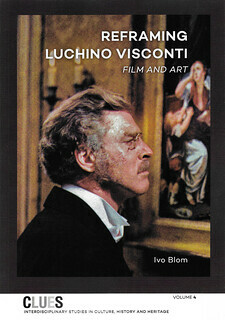 The film was produced by Terra-Filmkunst. Austrian postcard by Iris Verlag, no. 949. Photo: Nordisk Film / Lux Film Verleih. Publicity still for Klovnen/The Clown (A.W. Sandberg, 1926) with Gösta Ekman. 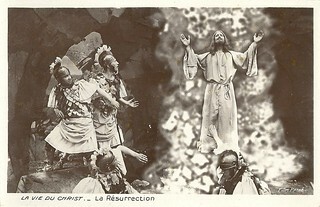 Austrian postcard by Iris Verlag, no. 589. 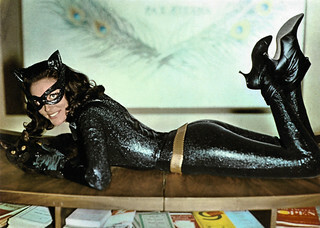 Photo: Lux-Film. 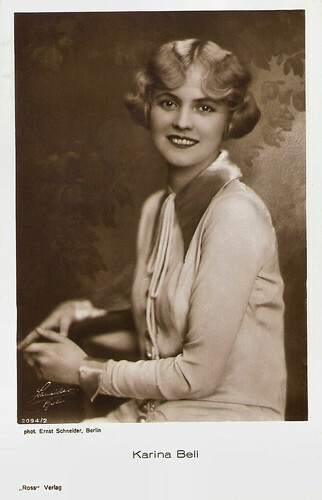 In 1926, Karina Bell followed A.W. Sandberg when he left for Berlin. In Germany she starred in Eheskandal in Hause Fromont jun. und Risler sen./Wedding Scandal in the House of Fromont Jr. and Risler Sr. (A.W. Sandberg, 1927) with Lucy Doraine, Nora Gregor and Fred Louis Lerch. In the period piece Revolutionshochzeit/The Last Night (A.W. 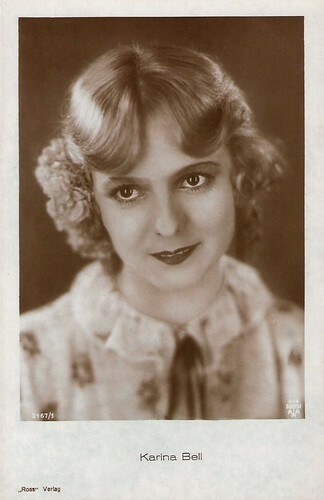 Sandberg, 1928), she co-starred with Diomiro Jacobini, Gösta Ekman and Fritz Kortner. 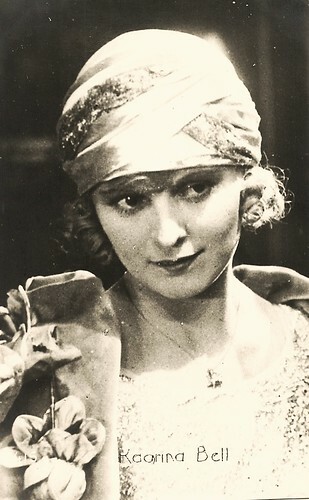 She also starred in Phantome des Glücks/Phantoms of Happiness (Reinhold Schünzel, 1929). She played a dancer opposite Michael Chekhov and Gaston Modot. The film was originally made as a silent, then re-released in 1930 with an added soundtrack. After the arrival of the sound film, she returned to Denmark. She performed in theatres in Copenhagen and Oslo, and she made two sound films: Nyhavn 17/New Harbour 17 (George Schneevoigt, 1933) and one last film with A.W. Sandberg, the comedy 5 raske piger/Five Healthy Girls (1933). In 1934 she married Knud P. Parkov, director of the Wiibroes Bryggeri (Wiibroes beer brewery), and gave up her stage and film career. When her husband died in 1949 she took over as CEO at Wiibroes under the name Karen Gudrun Louise Parkov. 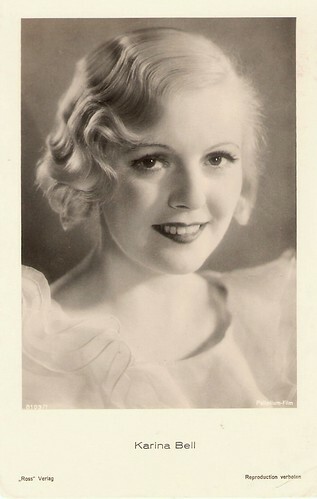 Karina Bell died in Denmark in 1979, at the age of 80. German postcard by Ross Verlag, no. 2094/1, 1927-1928. Photo: Ernst Schneider, Berlin. German postcard by Ross Verlag, no. 3167/1, 1927-1928. Photo: DEFU. German postcard by Ross Verlag, no. 3094/2, 1927-1928. Photo: Ernst Schneider, Berlin. German Postcard by Ross Verlag, no. 8103/1, 1933-1934. Photo: Palladium-film. Sources: Danish Film Institute (Danish), Den danske film database (Danish), Wikipedia (Swedish and English) and IMDb. Your posts have so much great info! So glad you are keeping these Starlets alive!!! Thank you. I've been studying Danish Silent Film. How perfectly lovely she is! I enjoyed this post so much. Your collection of postcards and the history surrounding them is just extraordinary. I am so glad you had such a lovely time with your sister. I have two sisters--and a bevy of adopted little sisters, who delight my heart.